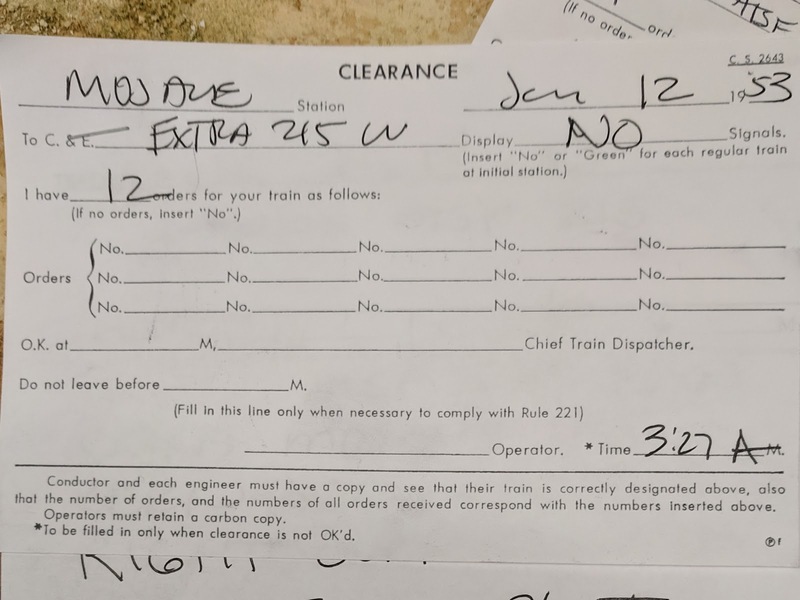 Extra 215 was the last train I was called for this weekend. Looks easy enough: I'll pick up my train with a set of ATSF F units in Boron staging, and run downhill to Bakersfield. Since I knew I'd be navigating around some scheduled trains I figured this would get me into Bakersfield by about 5:30 - 6:00pm, which should leave plenty of time to for my return flight home at the end of the weekend. La Mesa doesn't use a fast clock. All times on paperwork and schedule are actual current time, we just need to keep track on whether it's AM or PM. 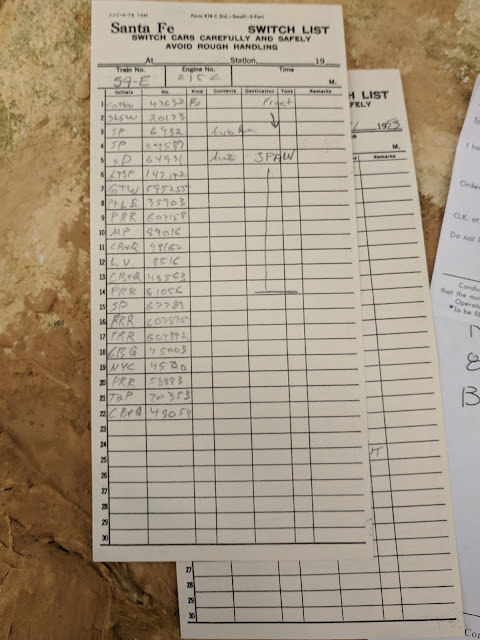 The crew for this train was nominally called for 3:30 in the morning layout time, but I got to my train at Boron staging a bit early, picked up the switch list from the East End staging operator, and pulled out of staging into Mojave Yard. 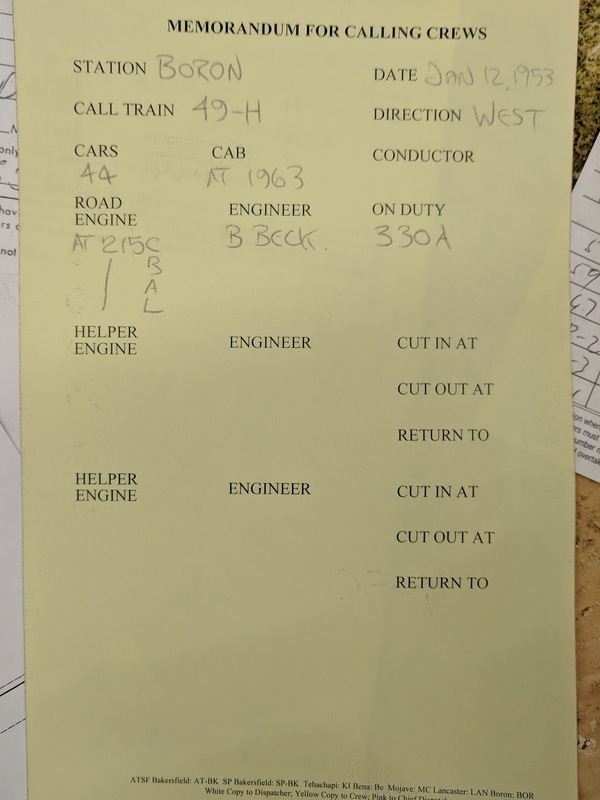 While the station agent called dispatch to get my paperwork, I checked the timetable to prepare for the trip. Since I'm going west, I'm looking in the eastward schedule for opposing trains. 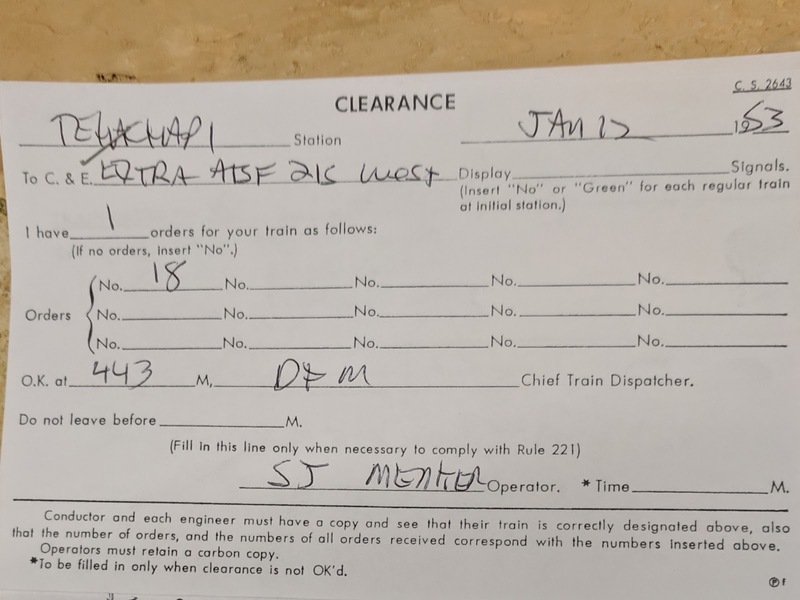 I need to pay attention for two things: Trains that supposedly should have arrived within the last 12 hours, as well as trains that I will likely meet somewhere on the way to Bakersfield. 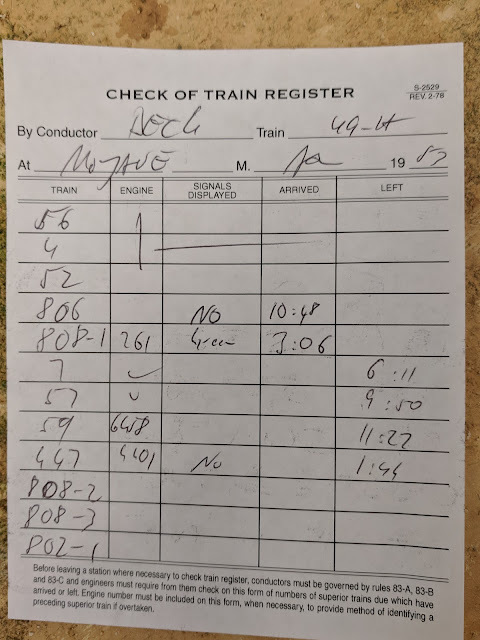 It's 3:20am, first class trains arriving in Mojave recently are 56 at 11:08pm, 4 at 7:18pm, and 52 at 3:58pm. 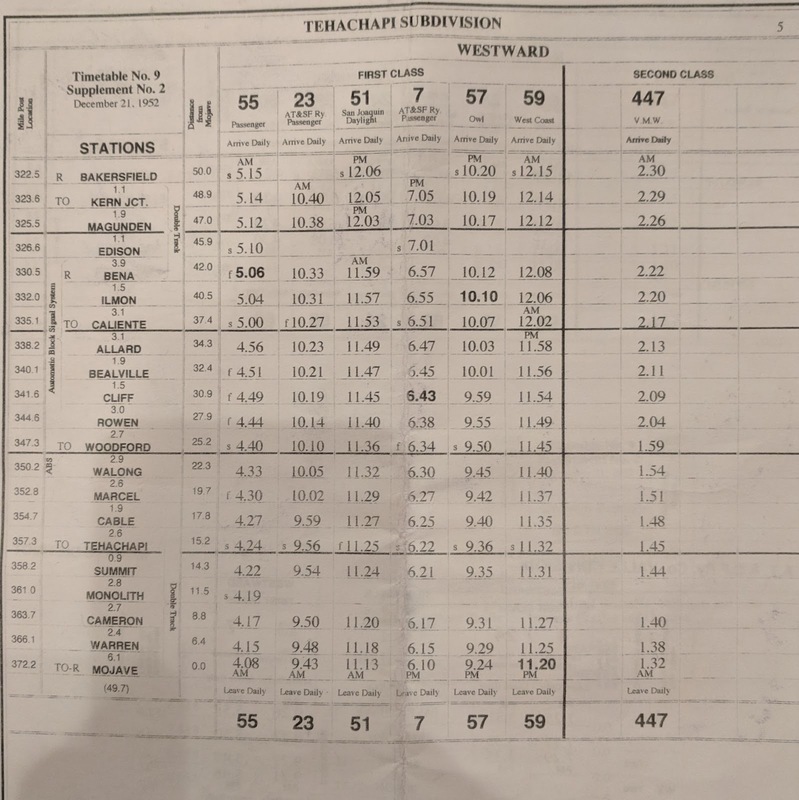 Also third class trains 808 (9:25pm) and 806 (3:43pm) should be here. For westward trains, I need to make sure that any higher priority trains that are due to leave by now have actually left. Also, I need to keep track of any higher priority trains traveling in the same direction as me, so that I get out of their way in time. Based on the schedule, I need to make sure that first class trains 59 (11:20pm), 57 (9:24pm), and 7 (6:10pm) have left, as well as second class train 447 (1:32am). Train 55 will be about half an hour behind me. I'm still waiting for my clearance so I check the train register book at the west end of Mojave station to confirm my expectations and copy the information to my check sheet. 56, 4, and 52 have indeed arrived. Train 806 arrived with NO signals at 10:48pm, hence that train is complete. The first section of train 808 arrived with green signals at 3:06am. Uh oh ... 808 is not complete yet and the first section got here 6 hours late. For westbound traffic things look more rosy. 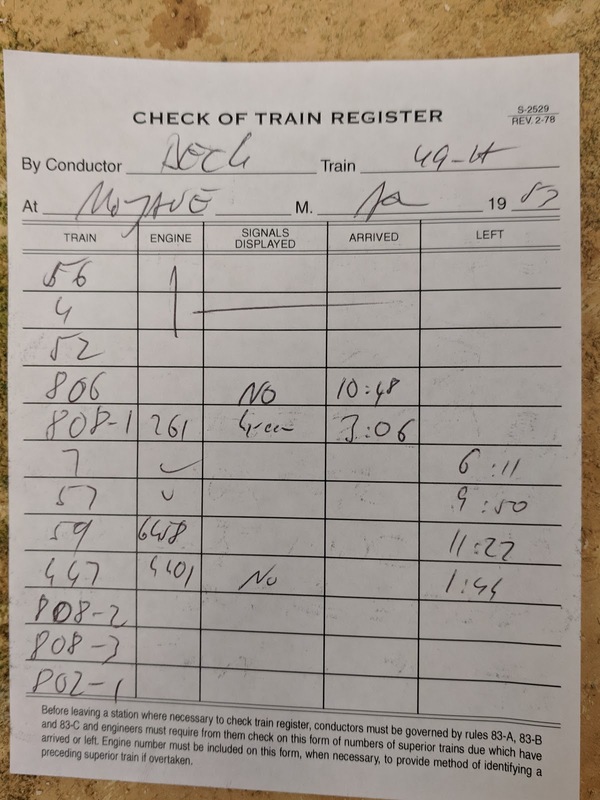 First class trains 7, 57, and 59 left Mojave about on time. 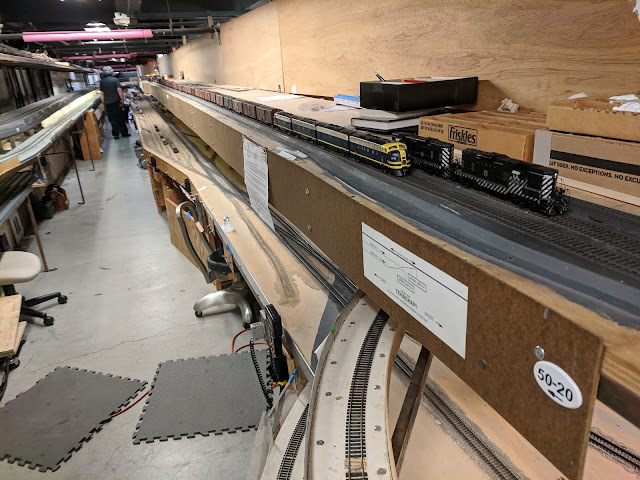 447 ran as a single section roughly on time as well. 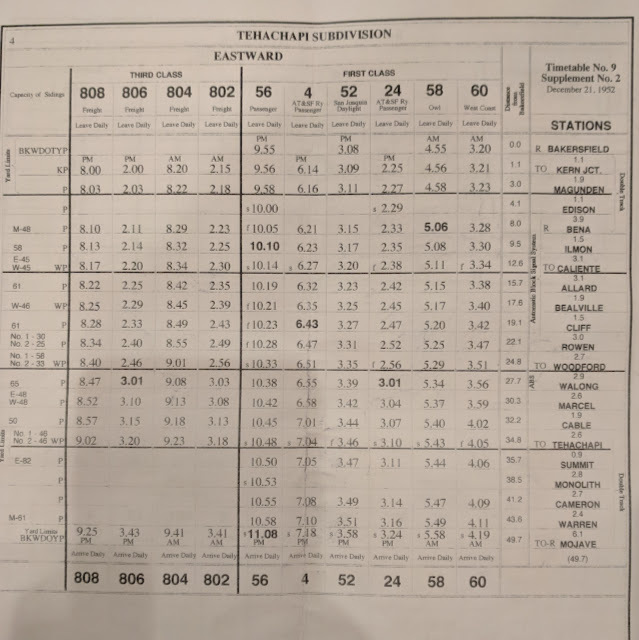 I have to look out for remaining sections of 808, as well as all sections of 802. 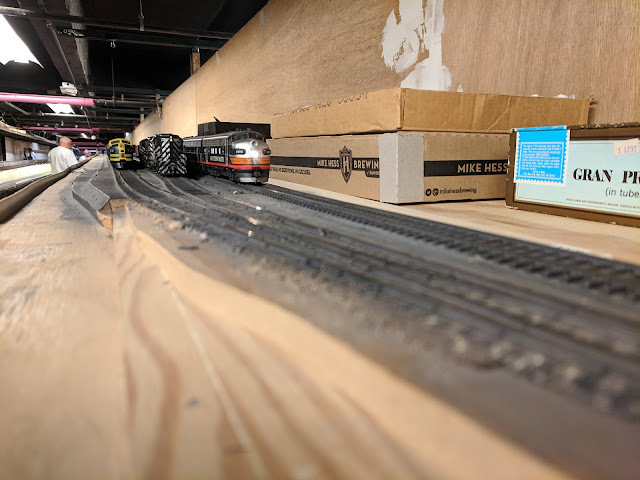 Plus, watch out for trains 58 and 60. 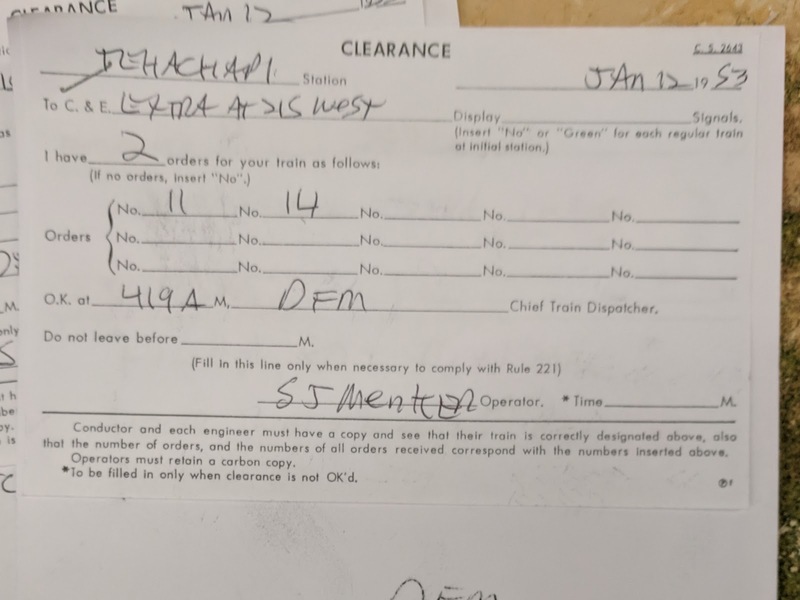 It's 3:40am, I get my clearance and orders from the Mojave station agent, who was apparently a bit tired. 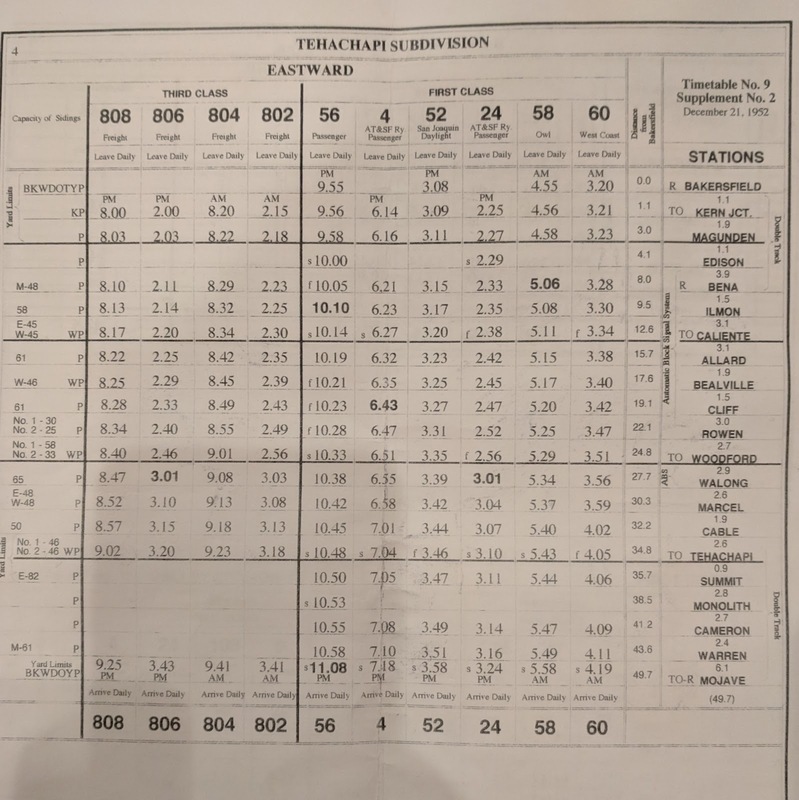 The order gives me authority to occupy the main line ("run extra"), and on the single track section between Tehachapi and Bena my train has right over the second section of train 802. With the train register check done, I know I can now leave. I record my departure in the train register and enter the double track main line railroad-west of Mojave. 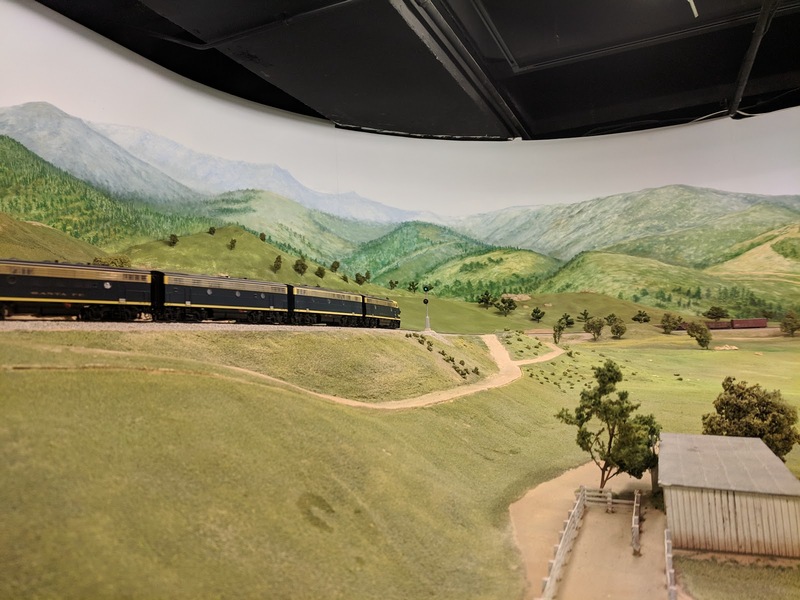 On the way to Tehachapi, I meet the second section of train 808 with no signals, hence train 808 is complete, and I don't need to worry about it any more. But where is First 802? On arrival in Tehachapi shortly after 4am, I pull past the station into the siding. 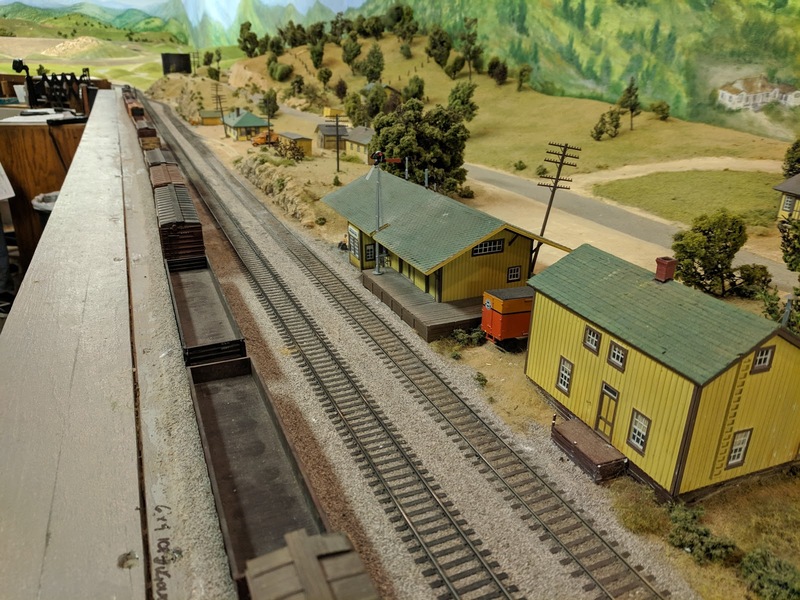 On the second siding a set of ATSF helpers is waiting for clearance to run downhill as well. 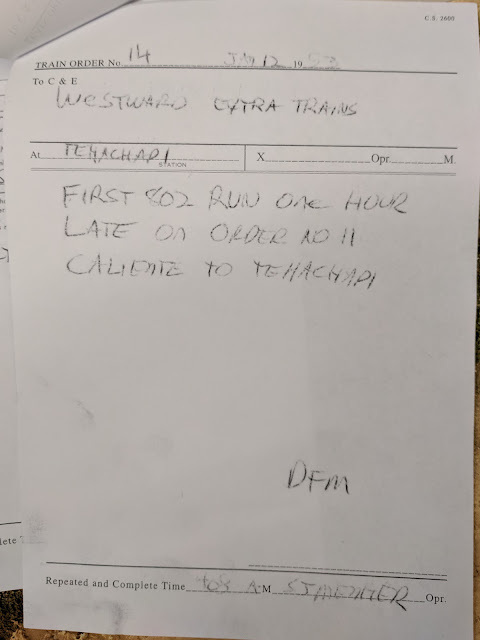 The timetable indicates that train 60 is due to arrive at 4:05am in Tehachapi, which means I'm stuck here at least until that train arrives. 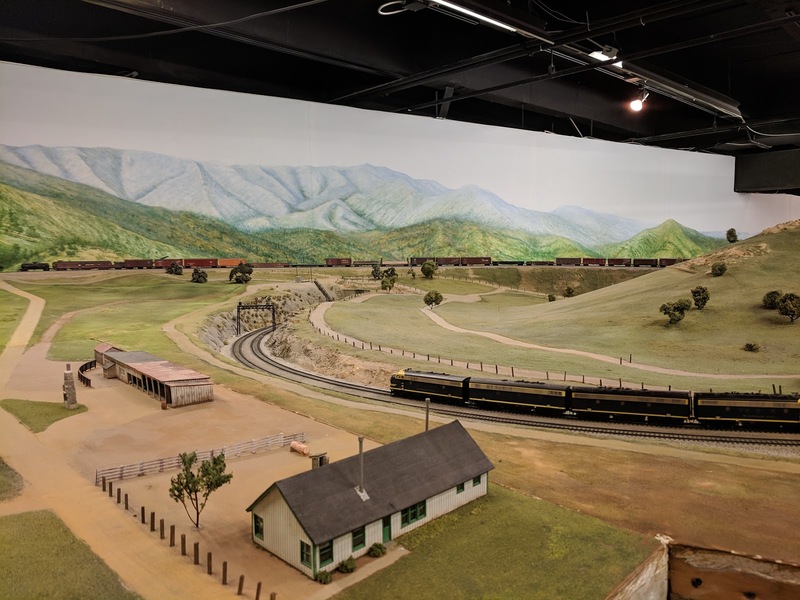 The track to Tehachapi is not accessible to visitors of the museum and the area is quite utilitarian. 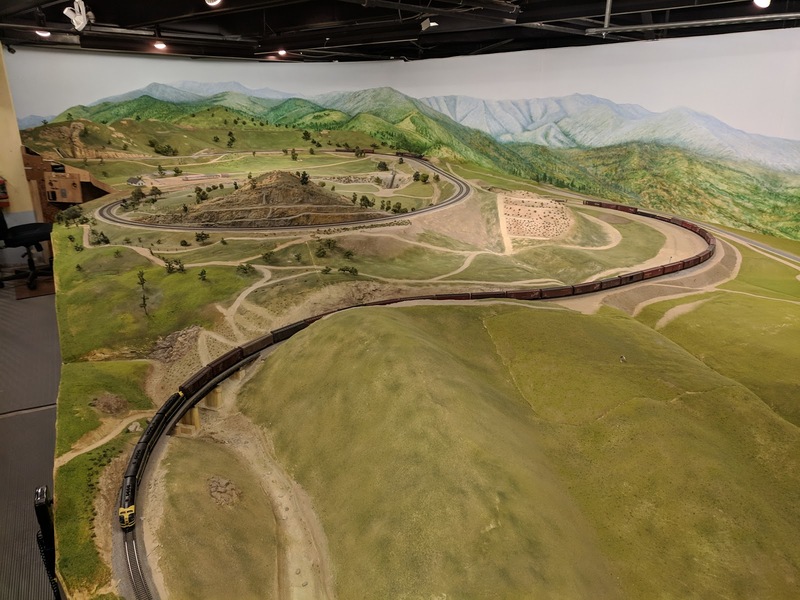 Mojave is the yard visible on the lower level, Tehachapi is on the upper level, while the connecting double-track line runs along the wall on the left and doubles back on itself. Staging is on the lower level off to the right from where I stand. 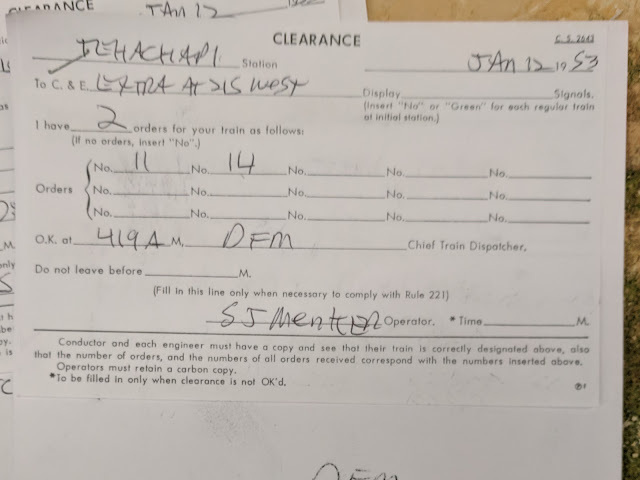 The Tehachapi station agent indicates he has more orders for me, and eventually I get this clearance and orders. The first order tells me that the first section of train 802 is running 90 minutes late. 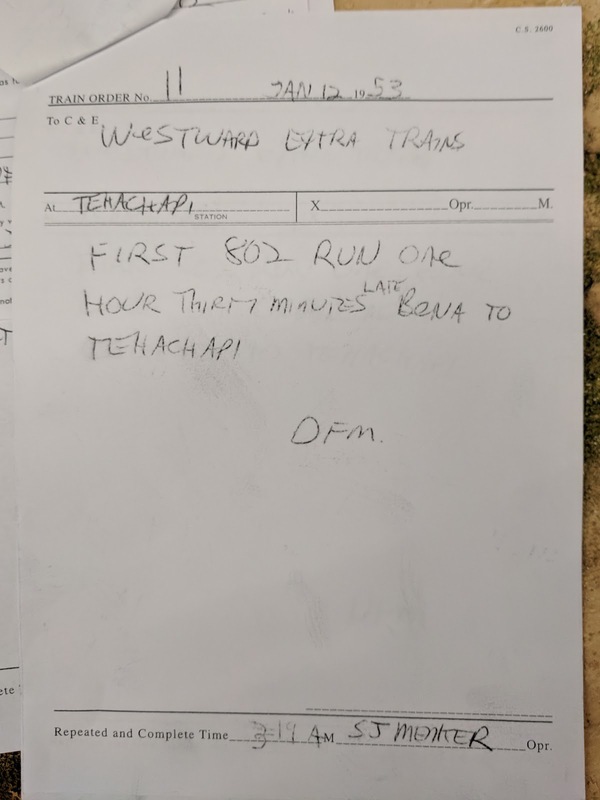 The second order tells me that First 802 is an additional 60 minutes late. So, instead of 3:18am at Tehachapi as indicated on the timetable, I should expect First 802 no earlier than 5:48am. That's fine. Let's wait for train 60, which was supposed to be here at 4:05am and is already overdue. However, even if they showed up now, I have another problem: Train 55 is due in Tehachapi at 4:24am, it's now 4:25. Since 55 is a westward train it has priority over train 60, so that train is now likely in a siding somewhere waiting for 55, too. 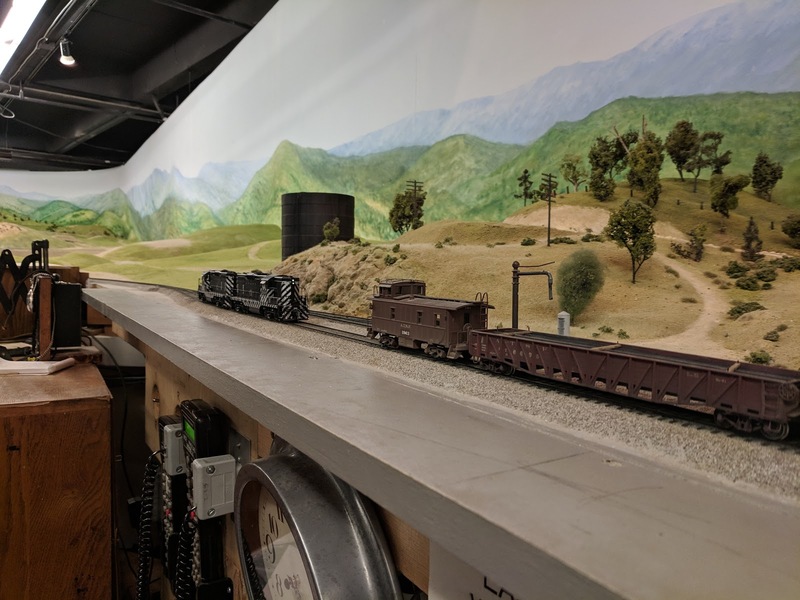 While I'm still contemplating all of this, a Southern Pacific freight train pulls up at the end of the double track section and stops at the Tehachapi station. 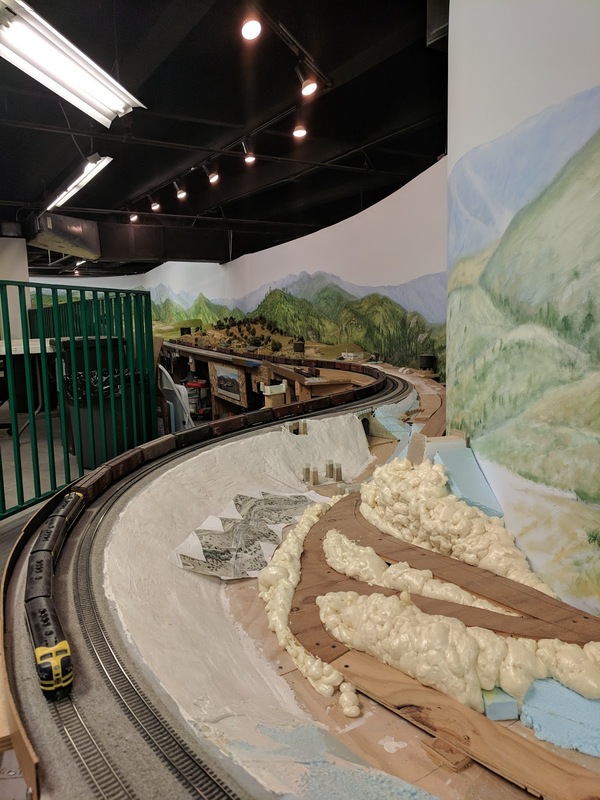 That train blocks the westward main line, so now 55 can't get by either when it will get to Tehachapi. We're dead-locked. The station agent in Tehachapi conferred with the Dispatcher over the phone, and after a little while Dispatch settled on a solution. 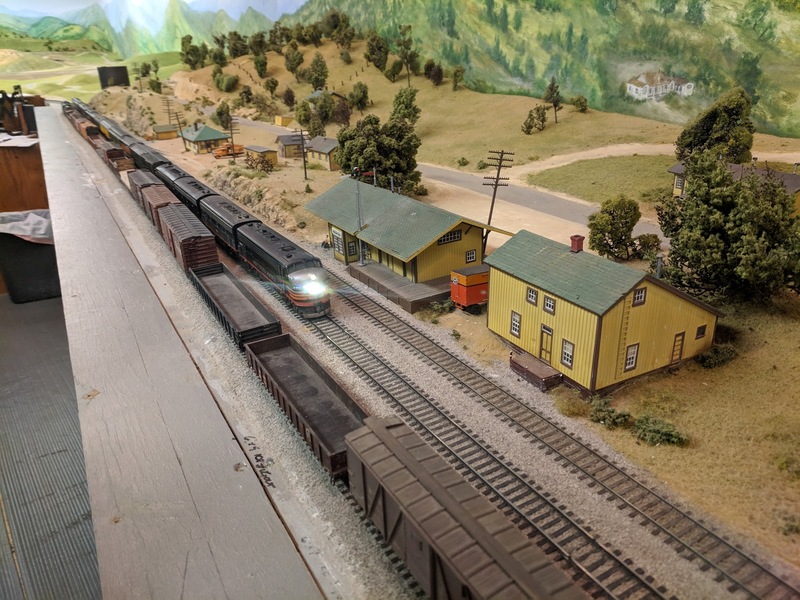 Extra 215 West (that's me), Extra 6202 West (the SP train stopped at the station), and Extra 2690 (the ATSF helpers in the siding next to me) all get to run down the hill before train 55 may follow us. We still need to wait for train 60 and its station stop. Train 60 probably got a "Run Late" order for train 55, so it could proceed from wherever it was waiting to Tehachapi. Once that was out of the way, SP 6202 got to go first, since they were blocking the main line. 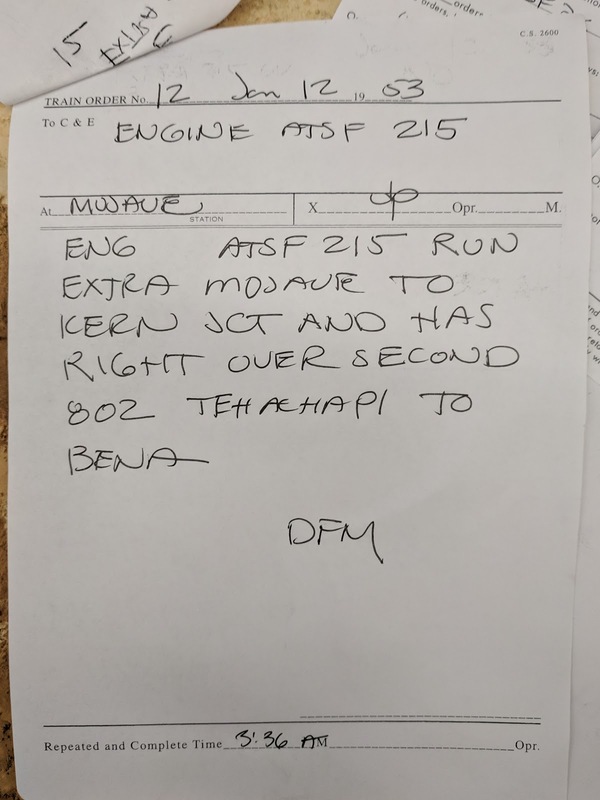 Here it is rounding the blob with the Tehachapi station agent position. 5 minutes later, I finally got moving as well. Here I am passing the Marcel siding at 5:02am. A couple minutes later at the West switch of Walong siding. Highball! 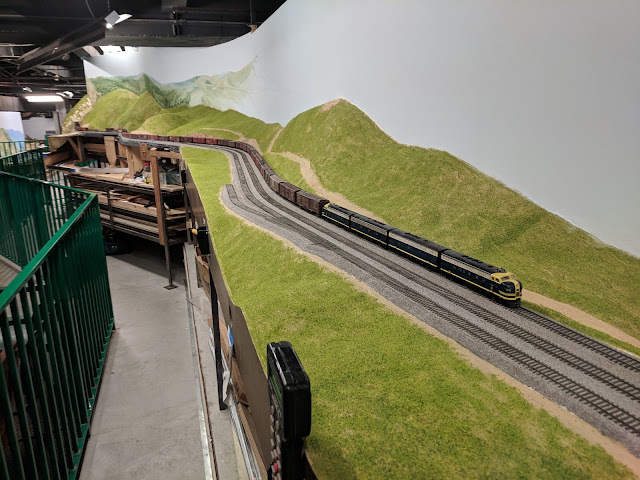 This train wasn't quite long enough to loop over itself, but the engineer can see the caboose up on the embankmen, while the engines are coming around the curve towards tunnel 9. 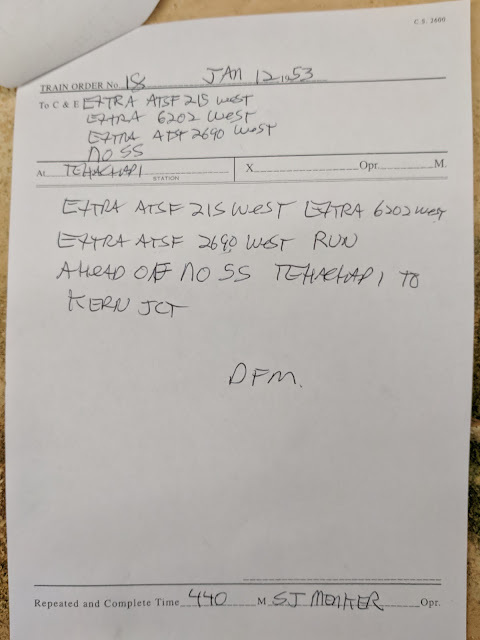 By 5:15am, I enter the siding at Woodford, here's why: Eastward train 58 is due at Cliff at 5:20am and at Rowen at 5:25am. 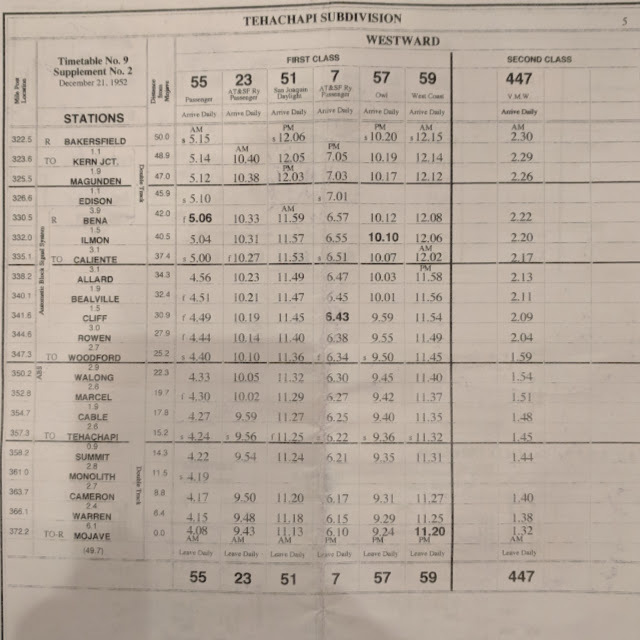 The timetable shows that it takes 9 minutes from Woodford to Cliff, and 4 minutes to Rowen. I could make the run to Rowen and be in the clear with 2 minutes to spare if I had stayed on the main track. However, the sidings at Rowen have space for at most 30 cars, and my train is 44 cars long, so I don't fit, which means I have to put my train into the long siding at Woodford and wait for train 58 here. At 5:19am, Extra 2690, the ATSF helpers we left behind in Tehachapi were catching up with Extra 215 at Woodford, too, and pulled into the siding behind me. The area between Woodford and Rowen is still under construction. At 5:32am train 55 pulls into Woodford on the main track. 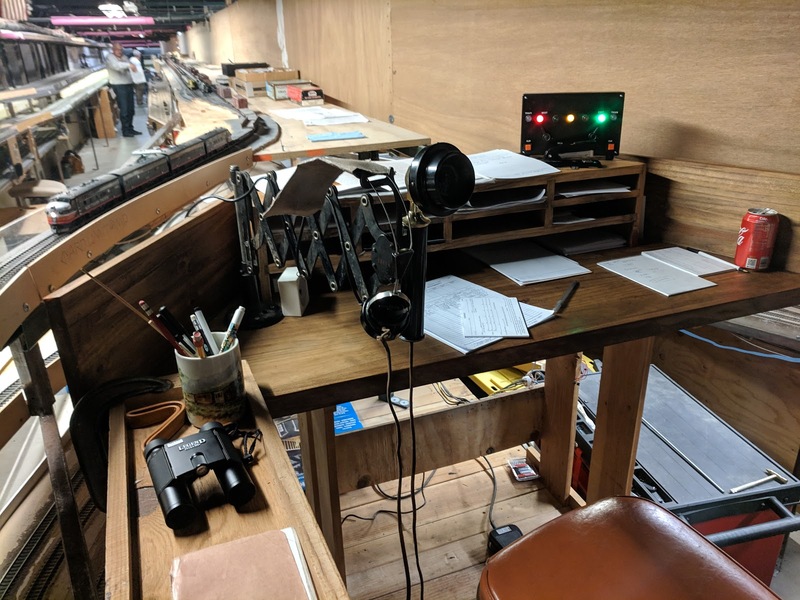 The train order board is up, so they stop and head over to the station agent to get more orders. At this point it became clear that Extra 215 would be stuck at Woodford for some time. This was a good time for me to call for a replacement crew, say Goodbye to La Mesa, and return to the real world. 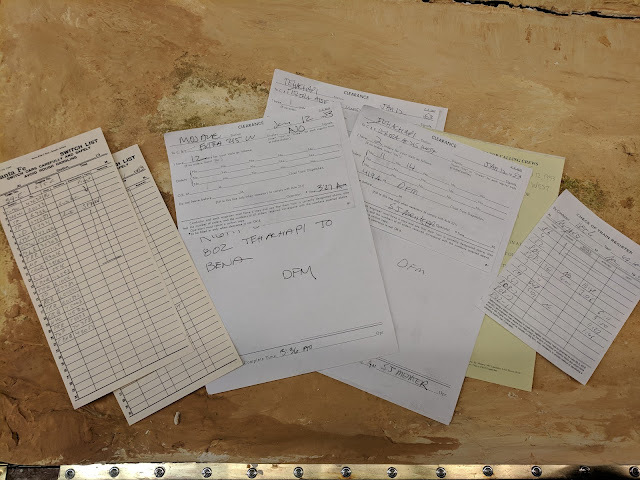 Here's an overview shot of the paperwork discussed in this post.